What is a random act of kindness? When a person unexpectedly does something kind for another person, just to be nice, that is a random act of kindness. For example, if you are walking to school and see that someone's garbage can is tipped over, you can pick it back up. Or when you are standing in line to buy your milk for lunch, you can pay for the person behind you to get milk as well. Or if you have two cookies in your lunch, you can give one to someone who didn't get a dessert. This activity will help you do random acts of kindness. Your Turn Think about random acts of kindness. Pick out someone in your class who is not your close friend. Write down five kind things you could do for that person without him or her knowing it. Choose one random act of kindness and do it without letting the person know who did it. Think about how good it feels to be kind secretly. 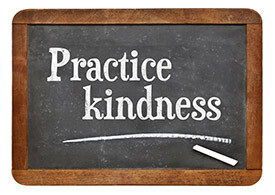 Doing Random Acts of Kindness by Thoughtful Learning is licensed under a Creative Commons Attribution-NonCommercial-ShareAlike 4.0 International License. Based on a work at k12.thoughtfullearning.com/minilesson/doing-random-acts-kindness.